Net Weight: Packet (280 seeds)1oz (43000 seeds)(+$7)1/4lb (172000 seeds)(+$17)1lb (688000 seeds) (+$40) This item is currently out of stock! Free flowering miniature ÒpansiesÓ produce abundant 1Ó blooms on compact plants. 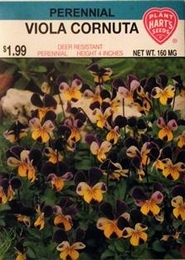 They withstand weather extremes better than Pansies. Mulching in winter with leaves or straw is helpful in areas with harsh winters. Planting time - indoors in late winter for blooms in first year, summer or fall for blooms in the following year. Thinning - when plants are 2-3 inches tall thin or transplant to 6 inches apart.